Catmint (Nepeta) is a member of the mint family. It is an extremely easy growing plant with few pests or problems. The billowing foliage is topped with spikes of flowers in early summer with repeat blooms throughout the season. Nepeta has slightly aromatic grey-green foliage that has a delicate, lacy appearance. The flowers can be white, pink or lavender-blue, and bloom on long spikes. The lavender-blue varieties are often used as a substitute for lavender plants, where lavender is not particularly hardy. Most catmint varieties have a somewhat sprawling growth habit, making them nice plants for edging and along paths. However, there are a few tall growing varieties, like ‘Six Hills Giant’, with a more upright habit. As with many scented, gray foliage plants, catmint is deer-resistant. Catmint is one of those plants that thrives on neglect. Many of the newer varieties of nepeta are sterile, producing no viable seeds. This is a plus if you don’t like the weedy, self-seeding habit of older catmint varieties, but it means you will need to either buy plants or make plants from divisions or cuttings. Choose a sunny spot with well-draining soil. A lean soil and somewhat dry growing conditions will encourage both more flowers and a stronger scent. Too much fertilizer will only make it grow lots of flimsy foliage. As with most plants, the mature size will depend on the variety you are growing. Most catmints are floppy, bushy plants that space about 10 to 24 inches tall and 12 to 24 inches wide. However, there are some varieties that are more compact and others that will grow 4 feet tall and 3 feet wide. New catmint varieties are being introduced regularly, so the best thing to do is to shop around and read the plant description before you buy. 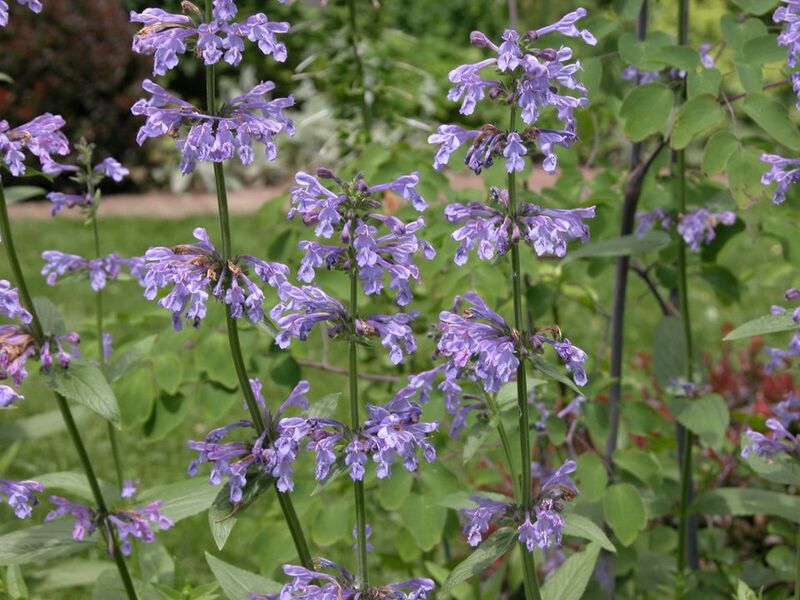 Expect your Nepeta to start blooming in early summer with repeat blooms throughout the growing season. Deadheading or shearing your plants will give you stockier plants and the lushest second bloom. You will get the best flowering if you plant your catmint in full sun, however, the plants will also grow well in partial shade. Humus-rich, well-draining soil is ideal. Many species grow easily in a wide range of soil types, including dry clay. First-year plants need frequent watering but once rooted, catmints are drought tolerant. Catmints like cool temperatures and once they are more developed, they become drought-tolerant. Add compost to the plant’s base in the fall, but once rooted it needs no further fertilization. Catmint plants will continue to grow and bloom well for years. But if you’d like to divide them to make more plants, all Nepeta varieties respond well to division in the spring. Find a section of the plant with undeveloped shoots and a good root system and slice it vertically with a spade. Replant the division, and keep watering it until it becomes established. Most catmints will repeat bloom if sheared back after their initial flowering. Some won’t provide much of a second show, but their foliage will be refreshed and tidied by the shearing. With its scented, fuzzy, gray leaves, problems with catmint are very rare. If something should attack the leaves, you can cut the plant back and it will very quickly regrow. Catmint is a classic design for planting under roses. The pale colors of catmint complement most roses and the soft, frilly foliage hides the ugly "knees" of the rose bush. It is also a wonderful plant for edging, where it softens hard lines. Catmint plants will gracefully spill over walls and walkways and are also a great contrast to spiky plants like iris and yucca. The pastel blues combine wonderfully well with pinks and yellows, such as daylilies and yarrow (achillea). Because of its similarity to lavender plants, catmint is often used as a replacement in areas where lavender does not grow well.